2.1 Sources of lutein. Where is lutein found? 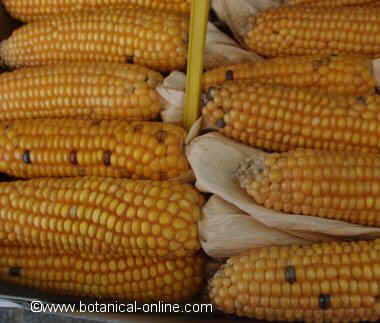 Corn is one of the richest sources of lutein. Lutein is a yellowish soluble pigment that appears in algae, bacteria and higher plants. It belongs to the group of carotenoids, which are a type of flavonoids. Lutein function in plants is to protect the plant against solar radiation. This same property is effective to protect the human retina of the sun’s ultraviolet radiation. Lutein is a pigment that appears in a natural way in the retina, along with zeaxanthin. Carotenoids both appear in the macula, the central region of the retina which provide its yellowing, but, while zeaxanthin is in the center of the macula, lutein occupies the sides. The conservation of this pigment is what allows filtering the sun’s ultraviolet rays, preventing the formation of many diseases, including macular degeneration or vision loss, which is a disorder characterized by loss of visual acuity, as consequence of degeneration that occurs in the macula. Similarly, it has been shown that high levels of these components in the eye retina defend against cataracts. Both pigments appear to also protect the body against the development of certain cancers. Sources of lutein. Where is lutein found? This component is present in vegetables and dark green vegetables: asparagus, Brussels sprouts, peas, spinach, lettuce, beans. They also appear in some algae, on nettles, and the petals of some plants such as calendula, where you get most of this component that appears in dietary supplements. Among the richest fruits have blueberries, plums, avocados, pears, apples, raspberries, oranges or strawberries. Pregnant or lactating women should not take lutein supplements, although it is wise for them to acquire this principle through food. A part of the intake of the aforementioned plant is in a considerable amount in the egg yolk. Since this carotenoid is not converted into vitamin A, lutein supplements should not be given with the intention of completing the deficiencies of this vitamin.